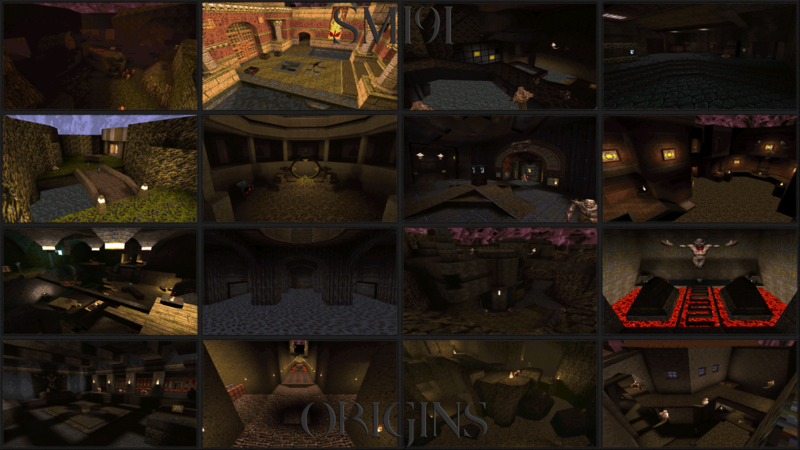 Sixteen maps of pure, unadulterated ID1 goodness. A tribute to the classics of 1996. Demos, please note I didn't finish every map, running on limited time (which is why I didn't finish my map (again)) and patience. My favorites were ww's, Ukko's, JCR's and Breezeep's. But the map I started will get finished. ...that the sounds the zombies make (particularly their "alert" noise) are reminiscent of an annoyed cat? Like if you woke up your sleeping cat by petting its fur the wrong way? Are there any first time mappers' maps in this pack? It's Maxx's second map made but first one released I think. Some of these really hit the mark with id1 style nostalgia. The Best Way To Kill Zombies Is To Have A Lady Friend. Streamed half the pack just now, some great stuff! Played Breezeep, Danz, Danz2, Digs, Gift, Pinchy, queenjazz and Yoder (not quite in that order). Will try to play the rest later this week, cool work everyone. Ok just finished playing these, great pack! Played ing, ionous, ish, maxx, jcr, scrama, ukko, ww. Very old school and refreshing maps. GG all. Good maps. In particular, really enjoyed Maxx's, Pinchy Skree's, and Scrama's levels!. Slowly making my way through these. Ditto for all the nice things said about Breezeep's, but I also just had to pop in here and give props to Giftmacher's map for being a challenging & fun & sometimes scary set of fights and ambushes (skill 2). Cranking out a string of good combat setups as a speedmap deserves some kudos. There's a lot of use of shadows and blind corners to create monster advantages, so some folks probably will be annoyed, but I didn't feel it was cheap... more like "I _know_ some things will ambush me in there so let's make sure they regret it!" Good times; nice work. A couple of positive comments about those maps though! First a quick note that JCR's map has one of the best uses of the wind-tunnel effect that I've seen in a while. As for Maxx's map: this is wayyyy strong for a first release. I liked the chunky but interesting brushwork and the way the spaces fed into and back through each other. I liked the lighting. Even the mild puzzley bit and a bit of "watch your step" flooring without turning it into a jumping puzzle. Thumbs up. Scrama, what is up with that transition into the second major area? Ridiculously good. And overall this map had a great feeling of a mini-adventure with progression into new spaces. Good nostalgic id1-ness in the middle stretch of the map. Although the lighting was more bright/flat/yellowish than the original id1 spaces of that kind, it still rang a familiar bell, probably from some very old custom maps that looked like that? And the layout was a nice little Quake gem. One last concrete detail I liked: the crusher trap. Cool little associated secret, and also the use of pulsing light there made the trap feel more dangerous than it actually was. Ukko: Great scene-setting. The horde fights were fun, although the first one seemed to have kind of a "right way" to do it, i.e. you have to notice/get the NG right away or you'll be hosed. Not a big deal tho since it's easy to restart. Yoder: I'm glad there was at least one remix/tribute in the pack. Good callbacks while still being different in entertaining ways. Only found half of the secrets -- bed time now -- it'll be fun to go back in and look for the rest to see what other cleverness you got up to!